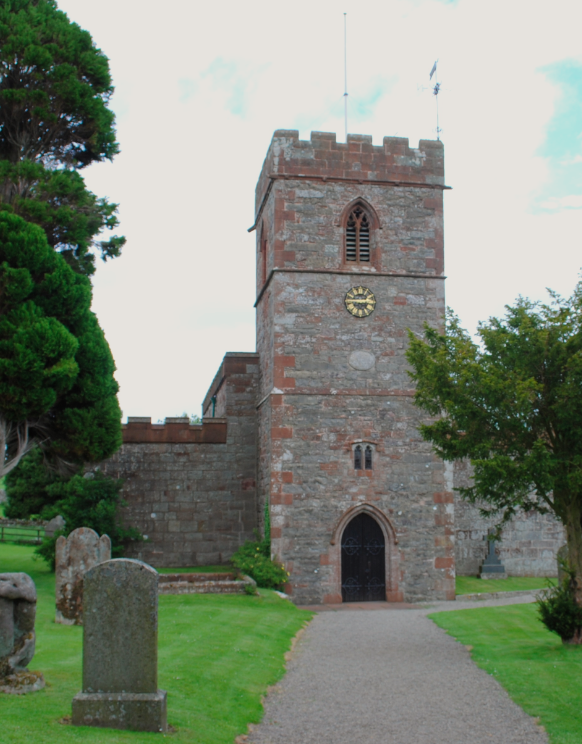 In the village of Dacre stands the parish Church of St Andrew. 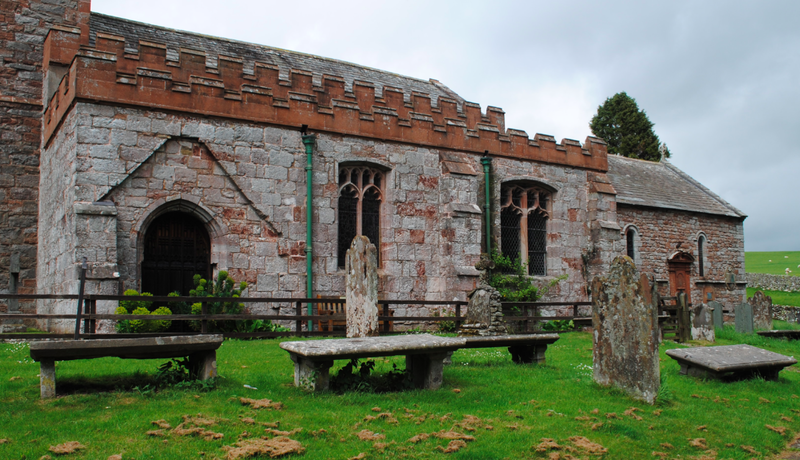 Constructed of sandstone rubble walls, the church dates to the late 12th century. With 13th century additions, the building was rebuilt in 1810 and features battlemented parapets which date to the 19th century. 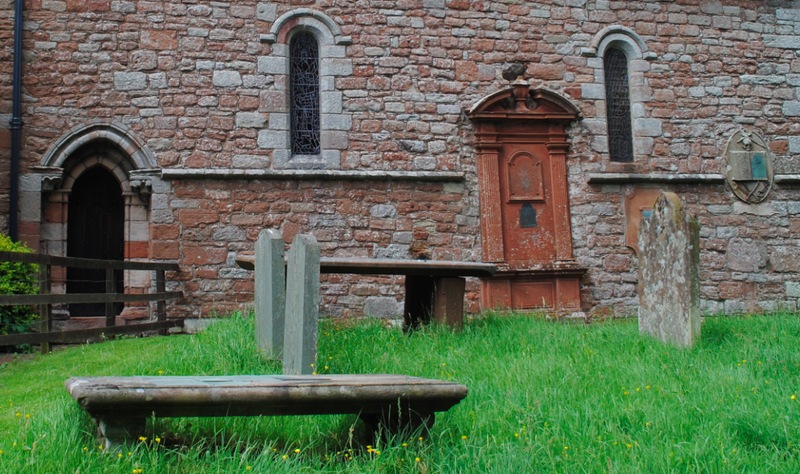 The church has a west tower of three storeys with an inscription above the entrance noting that the steeple was rebuilt in 1810. 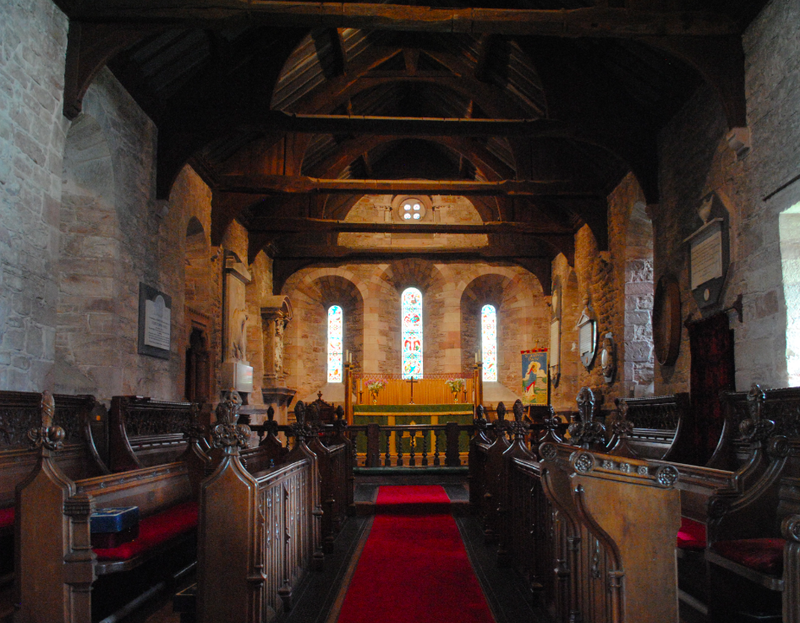 The three bay chancel retains 12th century narrow round-headed windows and has a late 17th century communion rail with twisted balusters. 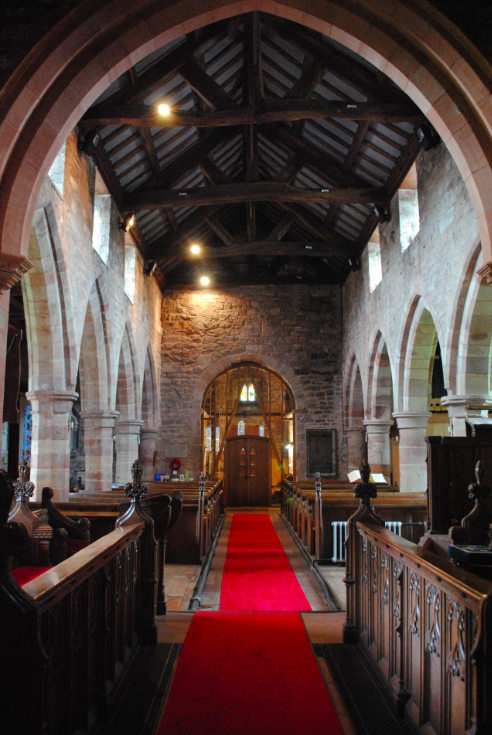 The nave features the original 12th century unmoulded round-headed tower arch and has two light clerestory windows. The four bay arcades date from the early 13th century and differ from one another. The north arcade is earlier having arches with slight chamfers and piers that are mostly round while the south arcade arches have normal chamfers and octagonal piers. 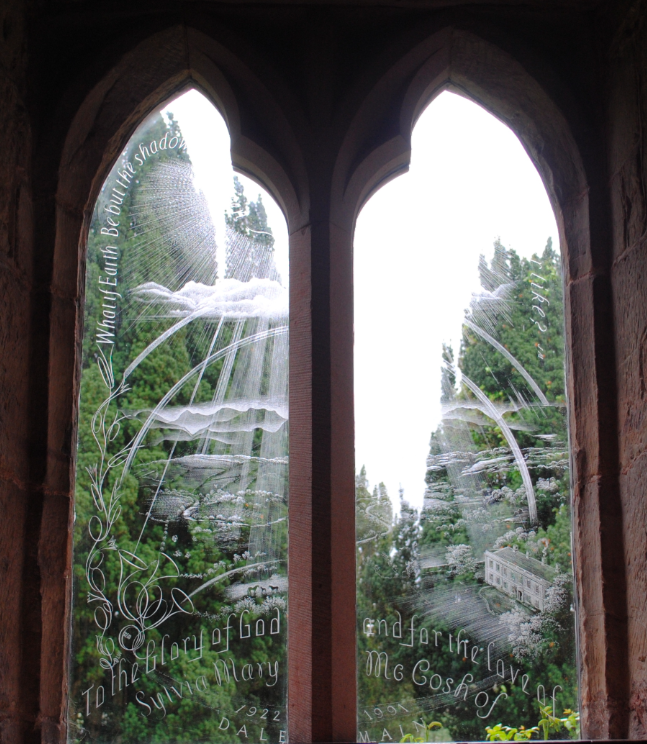 In the chancel of the church is an engraved window (above) by Sir Laurence Whistler as a memorial to Sylvia McCosh. Whistler was a poet, writer and glass engraver who revived the technique of line engraving on both sides of the glass. This intricate engraving creates an illusion of perspective in his depiction of landscapes and was a popular technique during the 17th and 18th centuries. Sylvia McCosh of Dalemain was instrumental in bringing the gardens of Dalemain House back to life following the war. She had successfully nurtured small plants and seedlings since childhood and faced with the task of bringing a dormant garden to life again, she introduced many plants which flourished in her garden in Lanarkshire, including Meconopsis grandis, and over one hundred varieties of old-fashioned roses. Before her death in 1991, Sylvia started a campaign for a pipe organ in the church to replace the 19th century organ that had been removed in the 1970’s. Following extensive fundraising, the new organ was finally installed in 2002. 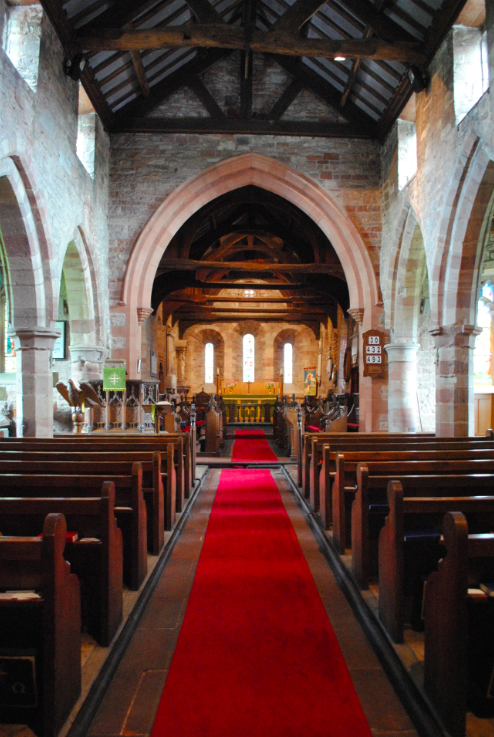 The Church of St Andrew is Grade I Listed.